If you’re looking for Amish furniture in Indiana, there’s a lot to choose from. The Hoosier State is home to America’s third-largest Amish population. Many Amish woodworkers reside in the numerous Indiana communities that cover the state from north to south. From Indianapolis to heavily-Amish northern Indiana, furniture retailers sell Amish-made beds, tables, chairs, children’s furniture, outdoor furniture, and much more. Residents of South Bend, Evansville, Bloomington, Muncie and other Indiana cities will find Amish furniture sellers within easy reach. In this Indiana Amish furniture directory you’ll find an extensive list of Amish furniture sellers across the state. Large Amish furniture producer with a wide range of styles and designs. Amish owners LeRoy and Ida Weaver employ a number of their nine children in the family business as well as working with other Amish furniture makers. Offering a full range of furniture including dining room sets, desks, hutches, buffets, plasma tv centers, chests of drawers, bedrooms suites, nightstands, dressers, armoires, and much more. Featured woods: Oak, quarter-sawn oak, cherry, rustic cherry, hickory, rustic hickory, walnut, maple, brown maple, gray elm. Offering a wide range of Amish-made living room, bedroom, office, children’s and upholstered furniture, and more. Also sells clocks along with cabinets through the Riegsecker Cabinet Co. business. Blue Gate Restaurant and Theater along with the Riegsecker Carriage Company are among the numerous partner businesses. Providing Amish furniture in a range of woods and stains. Contemporary and classic styles (ie, Shaker) for every room of the house, including children’s furniture, executive office furniture, bedrooms, entertainment centers, and a range of home accessories and furnishings such as quilt racks, chandeliers, chests and trunks, jewelry boxes, bread boxes, cutting boards, Lazy Susans, and more. Amish furniture in oak, quarter-sawn white oak, maple and cherry hardwoods. Pieces designed as “replicas of…family heirlooms”. Amish-made tables, desks, mirrors, chairs, dressers, entertainment centers, armoires, occasional tables, and more. 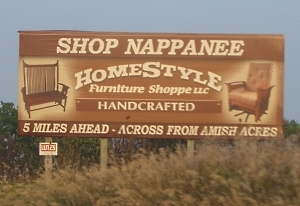 Extensive retail shop of Amish furniture in downtown Nappanee. Custom-crafted and finished Amish furniture in a wide range of designs. Amish children’s furniture, living rooms, bedrooms, kitchen tables, chairs, kitchen islands, and more. Amish cabinets and furniture made from hardwoods such as mahogany, maple, walnut, ash, cherry, and quarter-sawn white and red oak. Furniture including entertainment centers, occasional tables, bedrooms, in both Mission and Shaker styles. Amish crafted custom furniture as well as an in-house line of furniture. Offering standard hardwoods such as oak, walnut, maple and cherry as well as less common woods like knotty alder and mahogany. Rocking chairs, bars and barstools, gun cabinets, poker tables, metal chairs along with full lines of bedroom and dining room furniture. Additional less-common Amish-made items including fireplace mantels, magazine racks, lavatory vanities, podiums, country club lockers, and trophy cases. Wide range of Amish furniture for the dining room, office, living room and family room. Featuring mortise-and-tenon joinery, dovetails and high quality furniture finishing. Carrying the Simply Amish brand of Amish-made furniture. Find more Indianapolis-area furniture stores here: Amish Furniture Indianapolis. Range of Amish-made furniture as well as custom kitchen and bathroom cabinetry. Hardwoods including White Maple, Brown Maple, Oak, Cherry, Quarter-Sawn Oak, and Walnut. Wide range of furniture including some Amish-made. Amish-made coffee tables, dining sets, cedar chests, hutches, recliners, sofa tables, Mission, Shaker style furniture. To locate Amish furniture dealers in neighboring states visit the Amish Furniture Guide main directory page. Note to Indiana residents: Please be sure to check opening hours of any Amish furniture businesses listed in this guide before traveling long distances to visit them. While we strive to keep this directory up-to-date, business locations and availability can change. Not responsible for changes to information. Though the Indiana Amish population is large, as a whole, Indiana does not have the same furniture tradition as seen in the other two big Amish states, Ohio and Pennsyvlania. One reason for this is that Amish in the state have more readily pursued alternative occupations such as factory work–particularly in the large northern Indiana communities of Nappanee and Elkhart-Lagrange Counties. However, due to its sizeable Amish population, there are still quite a few Amish furniture craftsmen in the Hoosier State. Though higher proportions of Amish in northern Indiana work in RV factories, dozens of Amish woodworking and cabinet shops can be found throughout the area. In the southern Indiana community of Daviess County, entrepreneurship thrives, and numerous small-scale furniture and cabinet makers create a wide range of wood products. Amish furniture makers can be found in the large Swiss Amish settlement based around Berne in Adams County (south of Fort Wayne), but relatively few exist in the Allen County community. Pennsylvania Amish transplants to Parke and Wayne Counties have brought their knack for furniture craftsmanship with them. And a number of furniture makers can be found in the relatively small Milroy community, not quite an hour from Indianapolis. Much has been written on the attraction of Amish furniture. Boiling it down, there are a few key elements to the appeal of Amish woodwork. One is the reputation for high quality work which Amish possess. Rooted in Christian values, Amish culture praises a job well done. Amish are behooved to do well unto others in everyday life, and this approach naturally extends into the business arena. Amish craftsmanship is also associated with the use of high-quality materials. Pressed wood, fiberboard, and veneer are uncommon to Amish wood shops. Amish typically produce their furniture using top-notch hardwoods, ranging from oak and maple to cherry, walnut, ash, and poplar. The versatility of Amish furniture craftsmen is a big part of the Amish furniture appeal. Though Amish society, guided by cultural norms encoded in a church-wide Ordnung, limits the type of things Amish themselves possess, this doesn’t mean they don’t create products tailored to an English public. Contemporary styles, pieces that would be out of place in an Amish home, such as computer desks or entertainment centers, and highly fancy designs and woodwork are all well within the Amish repertoire. Custom woodwork by Amish artisans is available in many Amish shops. In addition to more modern styles, Amish also create a full range of classic motifs including the Queen Anne, Mission, Shaker, and Craftsman styles of furniture. Finally, you can’t overlook the appeal of Amish culture itself. In a world of mass-produced commodities, handcrafted furniture from a family-owned small business has a natural cachet. Buyers of Amish furniture appreciate being able to support a traditional way of life. The process of buying Amish furniture can even be an experience itself, with visits to Amish communities part of the journey for those who wish to partake in a more “hands-on” approach to selecting their Amish furniture pieces. Amish society has been most closely associated with an agrarian style of life. The first Amish arriving in America in the 1700s brought with them a European tradition of agriculture and animal husbandry. The agricultural life served the Amish well for their first two centuries in North America. In the latter half of the 20th century, however, pressures arose which compelled the Amish to take a different path. While numerous Amish remain in farming, small-scale entrepreneurship has come to be seen as the most viable option for preserving a family-oriented, Christian community-dependent way of living. As prices of land have skyrocketed in traditional Amish areas, and the pace of childbirth has held steady (along with high numbers of Amish adolescents choosing to join their parents’ church), farming has become less and less a feasible option. Small shops, and in particular woodworking businesses have offered a means of supporting a family on the home land in a manner reminiscent to the farm. Additionally, an Amish father is able to remain at home as a positive influence in his family and children’s development. The presence of a business on the home property also gives children a chance to develop a strong work ethic. For these and other reasons, small shops–which would also include quilt stores, dry goods stores, bent ‘n’ dents, machine shops, and many others–have rapidly grown in popularity among Amish. Like other small enterprises, furniture-making has offered special appeal to Amish, who place high value on family, community, and maintaining plain values in the face of worldly influences. Furniture-making looks to remain a popular occupation for Indiana Amish. Following recent severe challenges to the RV industry in northern Indiana, resulting in layoffs and unemployment among the area’s heavily RV-dependent Amish, entrepreneurship in the form of furniture shops and other businesses may offer greater appeal to the Plain community. Regardless, there will likely be no shortage in the Amish furniture supply in Indiana in the future, with numerous Indiana Amish furniture sellers across the Hoosier State. Find Amish furniture from the comfort of your home at an online Amish furniture seller. The Lagrange Elkhart area list has a LOT of manufacturers missing and outdated info and a business no longer open. Just thought you might want to know. Thanks F Frey, as I said this is not a comprehensive list. I actually have quite a few more to add to the Elkhart/Lagrange section, which I hope to get to soon. And you know what–it would be helpful if you could indicate which business is no longer open, if you don’t mind? With any list of businesses that is going to occur. Thanks. There is also Riegenthaler’s (Spellcheck me please) in Shipshewana, just yards from the Blue Gate restaurant, unless they have gone out of business in the last 8 months, which I find unlikely. Also, most of the RV manufacterers have closed-only a handful remain open. I have a large black cherry tree down…would love to have mantels made…how do I find Amish craftsman in Evansville area? Are there any Northern Indiana craftsmen who specialize in making furniture from Reclaimed barn wood? I’ve been looking for a portable wooden podium for our church, and I found one I liked with a price I liked on an Amish furniture web site and contacted them with no response. I have search alot of web sites not finding what I want with a reasonable price. Can you help me? I am trying to locate a replacement door for our Carriage Cameo. We were told they were made by an Amish cabinet maker near the Carriage factory. Any help would be greatly appreciated! I have a “sewing rocker” which is a family heirloom and in need of repair (fabrication of a piece for the back, caned seat, regluing, etc). It is at least 60 years old and probably closer to 100 years. Obviously, I am searching for a craftsman to care about the repair of this piece. Can you direct me to an Amish craftsman who might do this kind of work? Anywhere in Southern Indiana.Thanks. looking for someone that makes primitive furniture, pie safes, jelly cupboards, dry sinks and the like. I am looking for a craftsman to redo a caned seat on a rocking chair that is about 100 years old or more and a very special chair to me. I am in the Lafayette area but willing to travel in Indiana to find the right person. If anyone has any suggestions I would be grateful. Can you please let me know who would be a good contact to inquire about having a large quantity of wood games made in Indiana?